Destroying lives with slander-blogging is Julie Anne Smith’s fun hobby. Sometimes it even breaks out into a full on slander party, complete with comedians. Juvenile, lewd, parody twitter accounts are the life of the party, and so much fun for Julie Anne that she confesses that she nearly “peed” her pants laughing. When were Julie Anne and her activist “abuse” advocates having all this fun? While heartbrokenly trying to save the world from pastors who “abuse,” OR was she just trying to ruin a man, a woman, a church, and an entire fellowship of churches with her cyber-lynching slander campaign and having way too much fun doing it? Many of her tweets are too defamatory and perverse to even print. Apparently, while in the midst of tweeting out sexually explicit accusations of abuse, Julie Anne was having a regular party and laughing so hard that she nearly “peed” herself. Think about it. You don’t see genuine advocate groups engaging in juvenile, lewd, profane, comedic, banter. You don’t see MADD (Mothers Against Drunk Driving) doing that. You don’t see Pro-life advocates doing that. You don’t see real child abuse advocates doing that. A family being killed by a drunk driver is a very serious matter. Unborn children being murdered because they are inconvenient is a very serious matter. Children being abused physically or sexually is a very serious matter. Julie Anne and party are not “abuse” advocates. They are slander-bloggers throwing an extended internet slander party, and having way too much fun doing it. Here are a few of Julie Anne’s giddy tweets from the twitter cyber-lynching campaign; a portion of her party blog from Feb. 23rd, #WhoWouldJesusSue History, Results, and What Now with Calvary Chapel Lawsuit; a portion of Chuck O’Neal Fo Real’s juvenile twitter banter; and Julie Anne’s laughing fit from her Dec. 13th, 2012 blog. Alex Joye Grenier ‏@AlexGrenier7@DefendTheSheep LOL. Jezzy Cult! Julie Anne Smith ‏@DefendTheSheep @AlexGrenier7 Hush, Alex! Julie Anne Smith ‏@DefendTheSheep @AlexGrenier7 You really are drinking some Jezzy KoolAid Throw it away, dude. Since taking this screen shot, the “Fo Real” CON has identified his account to be parody account. So there ya go! CON will get to deal with CON FO REAL each time he tweets. Fun for us, maybe not so much fun for him. Chuck O’Neal FO REAL ‏‏@‏PastorChuckO Y’all, ignore that other Chuck O’Neal acct. He’s just being a d***. Real Chuck is trying to do what Jesus would do. Turn the other cheek. Chuck O’Neal FO REAL ‏@PastorChuckO Me (Real Chuck) and Fake Chuck @PastorChuck have decided to have an #epicrapbattle to raise money to #StopChildAbuse. Chuck O’Neal FO REAL @PastorChuckO #Epicrapbattle needs to be postponed. @PastorChuck_ lost his swag. He can’t rap without it. Has anyone seen it? He really misses it. Alex Joye Grenier ‏@AlexGrenier7 @PastorChuckO @PastorChuck_ Maybe B-rad from up in the Boo can fill in? #yeahyeah! 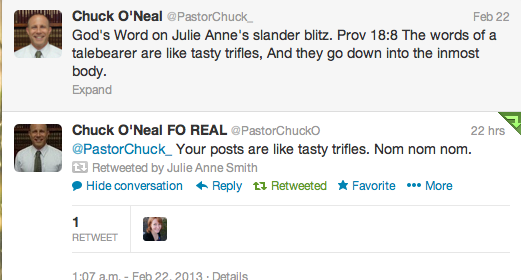 Chuck O’Neal FO REAL ‏@PastorChuckO #favoritebadassline is any line by @PastorChuck_. U r such a badass for creating a Twitter! Serious bro-crush going on between you and I.
Chuck O’Neal FO REAL ‏@PastorChuckO #BeforeiDieiWanna create a board game w @PastorChuck_. It’ll be like Chutes & Ladders. But we’re calling it ‘Suits & Slanders. Get it? Alex Joye Grenier ‏@AlexGrenier7 @PastorChuckO @PastorChuck_ LOL! Stop touching God’s anointed…or else! Chuck O’Neal FO REAL ‏@PastorChuckO @ChuckONeal_ Aww buddy, that was a weak shout-out. Don’t be afraid. Grab your balls. You still have them, right? Be a man and respond. Well, things have been a little too quiet around here and the kids have been caught. The kids aka Pastor Chuck O’Neal and “those with him” have created a blog using the domain name bgbcsurvivors.org. They are calling themselves True BGBC Survivors. Who or what have they survived? Us – the ones they sued. HAHAHAHAHA I’m sorry, I can’t help myself sometimes and I must find some humor in this somewhere. JULIE ANNE AND HER “ABUSE” ADVOCATES ARE HAVING WAY TOO MUCH FUN. Fun laughing at the self proclaimed title of “Jezeblog[ger] hahahaha.” Fun laughing hilariously at a lewd music video in which Chuck O’Neal FO Real has affixed the faces of the pastors that the slander-bloggers are trying to destroy (I haven’t seen it, I’m not going to provide the link, but Chuck O’Neal FO Real crafted it for slander-blogging laughs). Fun slandering. Fun destroying. Fun ruining. Fun abusing families, fathers, mothers, children, a developmentally challenged boy, pastors, churches, fellowships, and denominations with life destroying, ministry destroying “abuse” slander. Humor and wit have their place. The perverse humor and juvenile mockery abundantly evidenced in the midst of their so-called “abuse exposing” campaign, reveals what they really are. What are they? A slander-blogging lynch mob comprised of egalitarian, antinomian, revilers. *This statement reflects the opinions of the author based upon the facts as understood by the author. It IS just a game to her. Watching her descend on that poor Pastor in California with her media blitz; proclaiming to the world his absolute guilt because “she says so” while she sits cozily in her slippers 800 miles away laughing and making lewd jokes, was beyond disgusting. That’s not how someone genuinely concerned about real abuse acts. That’s NOT how a Christian acts. That’s how a disturbed person acts! PLEASE DO NOT STOP SOUNDING THE TRUTH ALARM! She has not repented. She is getting bolder. PROTECT and WARN the next CHURCH on her hit list!! It is absolutely disgusting. I think that she does it to get attention. Like when she had a tv crew interview her, it probably made her feel more important than she’s ever felt. Now she’s addicted to it. It is parasitic. If there were no people actively serving the Lord, she would have no one to tear down. Instead of doing something constructive with her life, she attacks people that ARE doing something constructive with their lives. Once she blasts one pastor enough, she moves on to a different pastor. Julie Anne is really going about her life in the wrong way. I don’t see the positive conduct from her that I would expect from a Christian. Just my two cents. This is a great blog article…I’m glad you brought this up. I have been amazed at the backwards progression Julieann has been on since she left BGBC nearly 5 years ago. Julieann is a woman who once said she loved our church, loved the teaching, loved being on the worship team, loved evangelism, loved the families and kids. Since her rebellious uprising in 2008 – look where she is now: attacking Biblical pastors (anywhere), attacking father-led homes, attacking home schooling, attacking modesty, attacking the Bible itself, which is really attacking God, and attacking the very families she professed to love. sorrow for sin, and the like. 3) They shun the company of lively and warm Christians. 4) They grow cold to public duty: hearing, reading, Godly conference, and the like. 5) Then they begin to pick holes in the coats of some of the Godly behind their backs. 6) Then they begin to adhere to and associate with carnal, loose, and wanton men. 7) Then they give way to carnal and wanton discourses in secret. 8) After this, they begin to play with little sins openly. perish in their own deceivings. Sadly, Julieann’s backward progression has taken her completely through all these steps. To hear how crass she can be when given a Scripture verse is truly disturbing. Julieann has not a shred of fear of a Holy, Mighty, God – who is one day going to hold her accountable for ALL of her slander-blogging ways. The “abuse” slander party just goes on and on… this tweet went out 12 hours ago from Hanna Smith, to Chuck ONeal Fo Real, about her mother Julie Anne Smith. @PastorChuckO You might have to take a break for a bit – my mother is dying of hysterics and can barely breathe she’s laughing so hard! How is “abuse” so much comedic fun for Julie Anne Smith? The “abuse” cyber-party rages on. I have lost count of the number and names of fake twitter accounts the “abuse” slander blog comedian/s have created. They are creating these twitter accounts, tweeting out witty slander and foolish banter, and then writing whole blogs about what a parody/slander twitter account tweeted. Picture rabid dogs chasing their own tails. The best I can tell the fake accounts are all authored by Alex, who also seems to be the author of several anonymous “abuse” slander blogs. Of course Julie Anne is faithfully following most of them and providing commentary. How can anyone take these people serious? Pastor Chuck… I have often wondered how anyone could take them seriously also. The only explanation I can come up with, is they don’t follow her that closely. They only see portions of what she blogs and tweets. Maybe only what they want to see? But I believe she is making her “true self” known… and eventually people will see her for what she really is. What’s that saying… Give ‘em enough rope and they’ll hang themselves. Matthew 5:11-12 says, “Blessed are you when others revile you and persecute you and utter all kinds of evil against you falsely on my account. Rejoice and be glad, for your reward is great in heaven, for so they persecuted the prophets who were before you.” Julie Anne and her friends are repulsive. The above comments left by Julie Anne and her friend Alex are both maddening and nauseating. This group of people continues to revile my father and spread all sorts of lies about him. In spite of their best efforts to destroy my dad and the work that God is doing through him, God continues to bless Beaverton Grace Bible Church. This entire ordeal has been a painful experience but as time goes on I see that God has used Julie Anne to make our church stronger not weaker, our love for God warmer not colder, and our light in this world brighter not darker. Like all of us, Julie Anne cannot escape God’s sovereignty and his ordering all things according to his will. Against her will, she is being used to heap rewards upon my father and upon our church as we have suffered under the persecution brought about largely by her hand. Last night many in our church were blessed to hear a sermon preached by Steve Lawson about the supremacy of Jesus Christ. Lawson touched on many truths including how Jesus does not tolerate sin in His church and about how Jesus will cut sin out of the church with the sword of His mouth. God desires Holiness in His church and will judge any church that neglects to seek it. How much more will God judge a pastor who lets sin run rampant in the church God has entrusted to his leadership? The only fault that may be charged to the leadership of our Church at BGBC is that Julie Anne and her friends were given too much grace, too much patience, and given too much benefit of the doubt. God has cut these people out of our church to purify it and they have gone out from us because they were never of us. While God’s church is composed of many members such as the head, the feet, or the hands, this group of people functioned as a malignant tumor. We are blessed to be free of them. In the same sermon above mentioned, Steve Lawson said something that made a powerful impression on me. He said that it is better to be in the midst of a fiery trial and persecution but held in God’s hand than to have no trial and to be outside of God’s grace. That is where my dad and our church are at right now and it is a good place to be. So know this Julie Anne, our God is for us. Who can stand against us? Certainly not you no matter how hard you try. No matter how many countless hours you spend seeking to destroy God’s servants you and the Gates of Hell will not succeed. What started out as a fit has turned into a consuming obsession for this lady. I encourage any readers looking for the truth to read and reread the comments left by Julie Anne and Alex above. They are the reviling’s of immature and ungodly minds that have been corrupted by their own evil desires. They are sad and frankly painful to read. One would not guess the comments were written by adults much less adults who claim to be acting in God’s service. Alex wouldn’t know what being a man is if it hit him in the face because let me tell you something my dad is a man. Anyone who meets him knows that. You are just another person with too much time on their hands who has a lot to say when they are sitting in obscurity behind a keyboard. So lay off and stop trying to act like the epitome of a real man simply because you know how to type. Thank you to those that have stood with us. You have been a great encouragement. BGBC Survivors. *The statements, videos, and information provided on this website reflect the opinions of the author based upon the facts as understood by the author.